511 Tactical Company CST 2.0 Boot (12033) FREE SHIPPING! The Company CST 2.0 from 5.11 Tactical is a comfortable, pull-on ankle boot designed for high performance. A full grain leather upper offers durable strength, professional looks and breathable comfort. The outsoles are highly slip-resistant, providing maximum safety regardless of terrain or substances on the floor. A perforated Neoprene Quick Call collar and kick plate allow for easy and rapid on/off of the boots. The Company boot's interior features an injection-molded Phylon insole and composite shank to provide impressive foot support and stability. OrthoLite sockliners offer lasting comfort for extended wear, while the antibacterial lining prevents odors from building up. 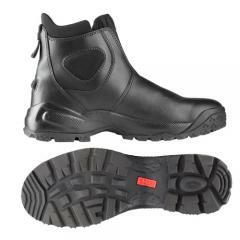 A rugged safety toe is constructed from composite materials and meets ASTM requirements for performance and safety. The non-metallic construction ensures the boots are travel-ready and airport-friendly. ©2002-2019 CopsPlus.com: 511 Tactical Company CST 2.0 Boot (12033) FREE SHIPPING!